Four salient features marked the planning for and the recapture of Corregidor Island.1 First, unlike the situation in 1941-42 when MacArthur's forces held the island as a final fortress, Corregidor had no significant place in Japanese plans for the defense of Luzon. Second, planning was based upon intelligence estimates that reckoned the Japanese garrison at less than one-sixth of its actual strength. Third, the assault plan called for a parachute regiment to drop onto a small, rough area ill suited to such an undertaking. Fourth, the operation involved the most difficult of all modern military maneuvers--a co-ordinated parachute and amphibious attack, which had so far during the war met with only limited success. Corregidor, logically the key to the defense of Manila Bay, was important to forces occupying Luzon only if the defenders elected to hold the strategically vital bay region. Thus, when Yamashita turned to a static defense in his mountain strongholds, the Japanese garrison on Corregidor became an isolated outpost of no strategic significance to him. Nevertheless, until the island was secured, the Japanese on Corregidor could harass Allied shipping within Manila Bay and could also use the island as a refuge for escapees from the mainland. Even if all military reasons for the early seizure of Corregidor could be brushed aside as of no moment, there still remained the matter of sentiment. Many officers at GHQ SWPA fervently awaited the recapture of "The Rock," and if it could be done dramatically--by means of a parachute drop, for instance--so much the better. from Mindoro, where the regiment had been stationed since its landing on 15 December. Krueger's planners also proposed a nearly simultaneous and supporting shore-to-shore operation, to be conducted by a reinforced battalion of the 34th Infantry, 24th Division, from Mariveles, Bataan. The date of the attack was set for 16 February. The decision to employ paratroopers to make the principal assault against an objective of Corregidor's size and terrain merits attention. Shaped like a tadpole, with its bulbous head pointing west toward the South China Sea, Corregidor is but three and a half miles long and one and a half miles across at its point of greatest width. (Map VII) The eastern--tail--section is sandy, wooded, and gently sloping, its highest point not much more than 150 feet above the bay. Near the center of the island, tunneled Malinta Hill rises abruptly to a height of some 350 feet, while immediately to the west the ground falls away just as steeply to a 500-yard-wide waist rising from sea level to a saddle about 100 feet high. Known as Bottomside to the two generations of American soldiers who garrisoned Corregidor before World War II, the waist boasted small docks on both the north and the south and was the site of the demolished barrio of San Jose. Bottomside's sandy beaches provided good points for amphibious assault. Equally good and wider beaches were to be found along the tail section--it had been on the north shore of the tail that the Japanese had made their main assault in 1942. West of Bottomside lay a gradually rising area known as Middleside, giving way on the west to steeper slopes leading to Topside, as the central portion of the tadpole's head was labeled. Covering a fairly even surface from 400 to 500 feet in height, Topside dropped precipitately to Manila Bay on the north, west, and south. Other than the slopes from Middleside, there were only two feasible approaches to Topside: James Ravine on the north and Cheney Ravine on the west, both easily defensible. Access to the western part of Middleside and to Topside's eastern slopes could also be had at Ramsay Ravine, at the southeast corner of the tadpole's head. The prospective cost of amphibious assault was, indeed, one of the chief factors that led to a decision to use paratroopers. Planners saw the obvious risks in sending parachute troops against such a small and rough target, but in view of the GHQ SWPA estimate that the Japanese garrison numbered only 850 men, the cost of the airborne operation promised to be less than that involved in an amphibious attack. Krueger intended to land almost 3,000 troops on Corregidor on 16 February, over 2,000 of them by parachute. Another 1,000 men or more would come in by parachute or landing craft the next day. Planners hoped that such preponderant strength, combined with intensive air and naval bombardment, might render the seizure of the island nearly bloodless. An equally important (if not even more decisive) factor leading to the decision to employ paratroops was the desire to achieve surprise. GHQ SWPA and Sixth Army planners hoped that the Japanese on Corregidor would judge that no one in his right mind would even consider dropping a regiment of parachutists on such a target. The defenses, the planners thought, would probably be oriented entirely toward amphibious attack. There was only one really suitable dropping ground on Corregidor, a prewar landing strip, known as Kindley Field, on the central part of the tail. This area was quite small and, not having been utilized by the Japanese, badly overgrown. Nevertheless, Col. George M. Jones, commanding the 503d RCT, recommended that Kindley Field be used as the drop ground after he had made a personal aerial reconnaissance over the island.6 General Krueger overruled the proposal quickly. A drop at Kindley Field, he thought, would not place the 'troopers on the key terrain feature quickly enough, and, worse, the men landing on the airstrip would be subjected to the same plunging fire that troops making an amphibious assault would have to face. In formulating final plans for the drop, planners had to correlate factors of wind direction and velocity, the speed and flight direction of the C-47 aircraft from which the 503d RCT would jump, the optimum height for the planes during the drop, the time the paratroopers would take to reach the ground, the 'troopers' drift during their descent, and the best flight formation for the C-47's. Planners expected an easterly wind of fifteen to twenty-five miles per hour with gusts of higher velocity. The direction corresponded roughly to the long axes of the drop zones, but even so, each C-47 could not be over the dropping grounds for more than six seconds. With each man taking a half second to get out of the plane and another twenty-five seconds to reach the ground from the planned drop altitude of 400 feet, the wind would cause each paratrooper to drift about 250 feet westward during his descent. This amount of drift would leave no more than 100 yards of ground distance at each drop zone to allow for human error or sharp changes in the wind's speed or direction. The 503d RCT and the 317th Troop Carrier Group--whose C-47's were to transport and drop the paratroopers--decided to employ a flight pattern providing for two columns of C-47's, one column over each drop zone. The direction of flight would have to be from southwest to northeast because the best line of approach--west to east--would not leave sufficient room between the two plane columns and would bring the aircraft more quickly over Manila Bay, increasing the chances that men would drop into the water or over cliffs. Since each plane could be over the drop zone only six seconds, each would have to make two or three passes, dropping a "stick" of six to eight 'troopers each time. It would be an hour or more before the 1,000 or so troops of the first airlift would be on the ground. Then, the C-47's would have to return to Mindoro, reload, and bring a second lift forward. This second group would not be on the ground until some five hours after the men of the first lift had started jumping. Planners knew that they were violating the airborne experts' corollary to ground warfare's principal of mass--that is, to get the maximum force on the ground in the minimum time. But there was no choice. Terrain and meteorological conditions played their share in the formulation of the plan; lack of troop-carrying aircraft and pilots trained for parachute operations did the rest. The margin of safety was practically zero, and the hazards were such that planners were reconciled to accepting a jump casualty rate as high as 20 percent--Colonel Jones estimated that casualties might run as high as 50 percent. To some extent the casualty rate would depend upon whether or not the parachute drop took the Japanese on Corregidor by surprise. And, if air and naval bombardments had not reduced the Japanese on Topside to near impotency by the time of the drop, a tragic shambles might ensue. reasons for including the amphibious attack, primary among them being the difficult problem of aerial resupply and the impossibility of aerial evacuation. Amphibious assault troops, planners believed, would probably be able to establish an early contact with the paratroopers on Topside and thus open an overwater supply and evacuation route. 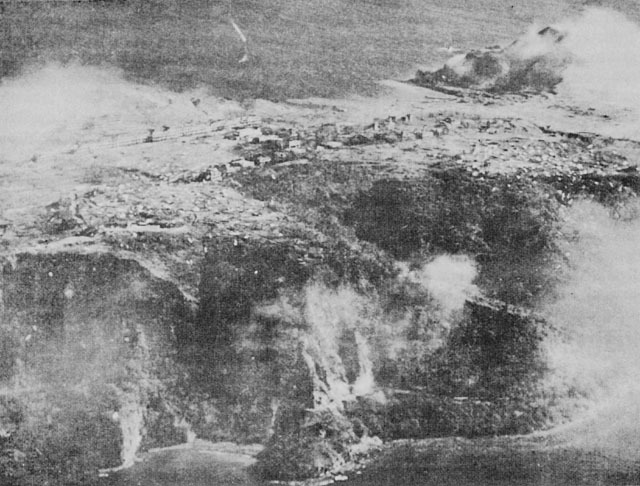 Moreover, the amphibious attackers stood a good chance of seizing Malinta Hill before the Japanese garrison could recover from the shock of preparatory air and naval bombardment and the surprise of the parachute drop. In any case, American troops would have to secure the hill before they could clear the tail of Corregidor, Bottomside, and parts of Middleside. Without the help of amphibious forces, the 503d RCT would have to attack Malinta Hill across the open area of Bottomside--an operation that, planners believed, would be most unpleasant. To minimize expected casualties during the shore-to-shore attack, the amphibious troops would make their assault two hours after the paratroopers started jumping. By that time, planners expected, the parachutists would be able to provide some fire support for the amphibious assault, while Japanese attention would be largely diverted to the manifest enormity of the situation on Topside. To allow visually directed air and naval bombardment as well as good visibility for the airborne assault, planners scheduled the parachute jump for 0830 and set the amphibious attack for 1030. The whole plan, of course, depended upon generally fair weather; an inclement dawn on 16 February would force postponement of both assaults. Corregidor and the other islands in Manila Bay were garrisoned by the Manila Bay Entrance Force under Capt. Akira Itagaki, IJN, who reported to Admiral Iwabuchi in Manila and whose headquarters was on Corregidor. Itagaki's forces, which included three Army provisional infantry companies and two Army provisional artillery batteries, were organized into provisional units and assigned defensive sectors. isolated positions along the tail. Itagaki's ravine defenses had no communication with each other or with Malinta Hill. Wire communications from each strongpoint led back to a central location on Topside, but even so it would be difficult for Itagaki to move forces quickly from one position to another around the periphery of Topside. Moreover, the early destruction of the communications center would lead to complete disruption of control. Thus, while he commanded a strong and fairly well-armed force, Itagaki's means of controlling the operations of his troops were extremely precarious. Corregidor had been under attack by Allied Air Forces planes ever since 22 January, when General MacArthur first designated the island as a target.9 The Allied Air Forces stepped up its attacks at the beginning of February and by the 16th of the month Fifth and Thirteenth Air Force planes had dropped some 3,125 tons of bombs on the island. On the morning of 16 February 24 B-24's hit known and suspected gun positions, 11 B-25's struck antiaircraft gun emplacements and the entire south coast, and 31 A-20's bombed and strafed generally, some of them paying attention to tiny Caballo Island, a mile to the south. Naval bombardment began on 13 February in conjunction with the bombardment and mine sweeping in preparation for the seizure of Mariveles. 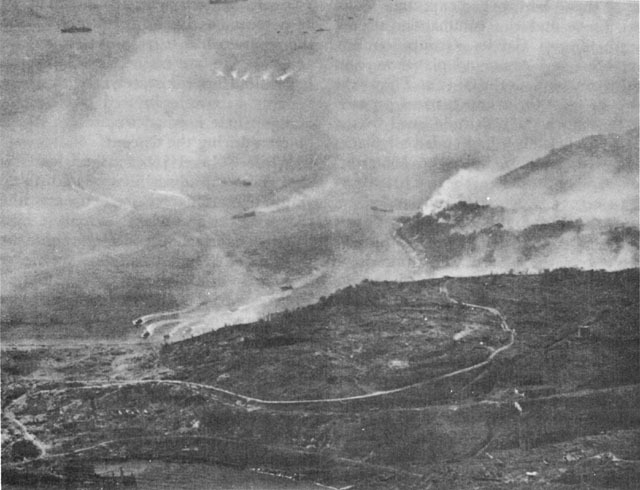 The cruisers and destroyers of Task Group 77.3 directed most of their fire at the north side of Corregidor, where the Japanese defenses seemed strongest. The next day Japanese fire from Corregidor damaged a mine sweeper and two destroyers, the mine sweeper so severely that it later had to be sunk. Admiral Berkey's ships proved unable to silence all the fire from Corregidor and had made large inroads in their ammunition supply in the attempt. Therefore, Admiral Kinkaid sent 3 heavy cruisers and 5 destroyers south from Lingayen Gulf to augment the fire of the 5 light cruisers and 9 destroyers Berkey already had under his command. The new arrivals joined in the bombardment about 1230 on 15 February. During the morning of the 16th cruisers and destroyers blasted the south shore of Bottomside, where the 3d Battalion, 34th Infantry, was to land; expended considerable ammunition on Caballo Island gun positions; and stood by for call fire the rest of the day. PT boats, which had already strafed some Corregidor shore batteries, were in position to rescue paratroopers who might land in Manila Bay. As the troop carrying C-47's hove into view, seventy A-20's of the Allied Air Forces bombed and strafed the eastern section of Corregidor and also worked over Caballo. so the 503d RCT was under the control of the Commanding General, Fifth Air Force, from the time the troop-carrying C-47's took off until the drop was executed. Upon reaching the ground, the RCT passed to the control of Sixth Army and Hall's XI Corps. For the purposes of centralizing control of operations on Corregidor, General Hall had organized Rock Force--the 503d RCT and the reinforced 3d Battalion, 34th Infantry. The organization of Rock Force, which was commanded by Colonel Jones of the 503d RCT, was to become effective when Jones reached Corregidor with the first lift from Mindoro. Floating earthward without being fired upon by the Japanese, the first man of the first lift of paratroopers was on the ground at 0833, 16 February, three minutes behind schedule.10 Jumpers from following aircraft encountered sporadic Japanese rifle and machine gun fire, but on the ground at Topside drop zones the paratroopers found only a few small groups of Japanese armed with light machine guns and rifles. These the parachutists either killed or drove off with little trouble. By 0945 the first lift was on the ground and assembled at Topside drop zones--the 3d Battalion, 503d Infantry; Battery C, 162d Parachute Field Artillery Battalion; a platoon of Battery D, 462d Parachute Field Artillery; Company C, 161st Airborne Engineer Battalion; and about two-thirds of Headquarters and Headquarters Company, 503d RCT, including Colonel Jones. The missions of the troops in the first lift were to secure and hold the drop zones for the second lift; prepare to move out to clear all Topside upon the arrival of the second lift; provide fire support for the assault of the 3d Battalion, 34th Infantry, at Bottomside; and, finally, establish physical contact with the latter unit as soon as possible. By 1000 the 'troopers had successfully accomplished the first mission, had completed preparations for the second, and had moved two .50-caliber machine guns in position on the southeast side of Topside to help cover the amphibious attack. The machine gunners, whose support fire was not needed initially, had a magnificent view of the assault at Bottomside. The 3d Battalion, 34th Infantry, had come to Mariveles with the 151st RCT on 15 February,11 and had left Mariveles Harbor aboard twenty-five LCM's of the 592d Engineer Boat and Shore Regiment at 0830 on the 16th. Taking a circuitous route around the west end of Corregidor, the first boats hit the south beach at 1028, two minutes ahead of schedule. Contrary to all expectations, there was no opposition as the men of the first four waves poured ashore. But as the fifth wave came in Japanese machine guns opened up from Ramsay Ravine and Breakwater Point, to the left rear--southeast--and from cliffs at San Jose Point, lying at the southwest corner of Malinta Hill. As vehicles reached shore they began detonating mines along the Bottomside beaches. In rapid succession a medium tank of the 603d Tank Company, an M7 self-propelled mount of Cannon Company, 34th Infantry, and a 37-mm. antitank gun of Antitank Company, 34th Infantry, were destroyed. Nevertheless, Companies K and L, 34th Infantry, pushed rapidly forward and gained a firm hold atop Malinta Hill by 1100. To that time amphibious landing casualties had been 2 men killed and 6 wounded, far below the anticipated rate. Surprise was complete. The lack of opposition to the first parachute drops and to the initial landing waves at Bottomside can be attributed both to the shock of preparatory naval and air bombardment and to the fact that the Japanese had not expected a parachute attack. Evidently circling bombers and fighters of the Allied Air Forces had kept the Japanese under cover while the LCM's and escorts approaching from Mariveles apparently diverted Japanese attention from the incoming C-47's. Indeed, since the C-47's resembled "Betty" bombers of the Japanese Army Air Force, the Japanese naval troops on Corregidor may have assumed that the troop-carrying aircraft were more American bombers. In turn, the parachute drop diverted Japanese attention from the amphibious craft moving on Corregidor. Obviously confused by the co-ordinated assault, the Japanese did not know what to do first. By the time they had recovered their wits sufficiently to take meaningful action, the 3d Battalions of the 34th and 503d Infantry Regiments had secured their initial objectives with negligible combat losses. north than planners had expected. Colonel Jones and the commander of the 317th Troop Carrier Group, circling overhead in a command plane, were in radio contact with the C-47's. They were able to have the troop carriers progressively reduce their altitude until by the time the first drop had ended all planes were flying at the right height. Nevertheless, most of the men of the first lift missed the assigned drop zones and landed on, in, and among buildings and trees away from the two fields. Of the 2,050 men dropping on 16 February, jump casualties numbered approximately 280. The resultant rate of 14 percent was 6 percent lower than that the planners had been willing to accept. Japanese fire and crashes into buildings had killed approximately 20 'troopers, roughly 210 were injured on landing, and Japanese fire had wounded another 50 men during the descent. While Colonel Jones talked with his staff about the advisability of continuing jump operations on 17 February, the troops on the ground began expanding a hurriedly formed perimeter around the drop zones. The 2d Battalion took over at the two drop fields and the 3d Battalion's Companies G and H--there were only three companies per battalion in the 503d Infantry--set out to secure the rest of Topside. Company H, assembling at the parade ground, rapidly cleared the main barracks building of a few Japanese stragglers and then moved 300 yards northward to secure the gutted hospital, whence one platoon dashed 600 yards northeast to seize a knoll dominating the entire northeast section of Topside. Company G, meanwhile, advanced eastward down the slopes toward Middleside to set up night positions near the head of Ramsay Ravine, only 250 yards from the closest elements of the 3d Battalion, 34th Infantry. The rest of the 503d's troops, patrolling all over Topside, discovered that Japanese strength seemed to be located west and south of the drop zones. By dusk combat casualties numbered about 55 men wounded, a much lower figure than anticipated. One unexpected blessing resulted from the scattered drop of paratroopers in the 0830 lift. Captain Itagaki, having been informed that landing craft were assembling off Mariveles, had hurried with a small guard to an observation post near Breakwater Point, obviously more concerned with the imminent amphibious assault than with the possibility that paratroopers might drop out of the C-47's already in sight of Corregidor. Suddenly, his attention was rudely diverted as twenty-five to thirty paratroopers who had been blown over the cliffs near the point began pelting down around the observation post. Fired on by the Japanese, the small American group quickly assembled and attacked. In the ensuing skirmish eight Japanese, including Captain Itagaki, were killed. Effective control among the Japanese units, already rendered practically impossible by the destruction of the communications center during the preassault air and naval bombardment, now ceased altogether. Leaderless, the remaining Japanese were no longer capable of coordinated offensive or defensive efforts. Each group would fight on its own from isolated and widely separated strongpoints. Once Rock Force was ashore, operations on Corregidor evolved into a large-scale mop-up. The size of the island and the nature of the terrain precluded maneuver by units much larger than a platoon, while the generally static and disorganized defense of the Japanese led to a "campaign" of small unit assaults. Colonel Jones's plan called for the 3d Battalion, 34th Infantry, to secure Malinta Hill and contain the Japanese on the eastern end of the island while the 503d Infantry cleared Middleside and Topside. After the 503d's job had been finished, Rock Force would overrun the tail. Within this framework, operations proceeded in a series of generally uncorrelated incidents. On the afternoon of 17 February the 1st Battalion, 503d Infantry, and other reinforcements reached Bottomside by landing craft. Japanese rifle and machine gun fire, most of which passed overhead, "expedited" the movement ashore, and the battalion soon joined the rest of the regiment on Topside. The troops already on Topside had spent the day expanding their hold, systematically reducing the first of the many Japanese bunkers, pillboxes, and underground defenses they were to encounter, and had developed a pattern for the destruction of the Japanese installations. advantageous points to cover approaches to a Japanese position, infantry assault teams moved forward behind white phosphorus hand grenades and the extremely close support of flame thrower teams. To avoid backflash and assure the deepest possible penetration of cave defenses, flame thrower operators often projected their fuel unignited, and then used white phosphorus grenades to fire it. If the Japanese within the caves still could not be induced to give up the fight, engineer demolition experts blocked the cave entrances. One Japanese tactic was both advantageous and disadvantageous to the 503d Infantry. Each night small groups of Japanese would attempt to reoccupy positions cleared during the previous day. To the 503d, this often meant some dirty, repetitive work, and additional casualties. On the other hand, the Japanese sometimes reoccupied tactically indefensible positions that proved easy to take out. The 503d Infantry seems to have been happy to let the Japanese occasionally return to such positions, secure in the knowledge that the only result would be more Japanese killed at no cost to the attackers. The only way to keep the Japanese from reoccupying less vulnerable positions was to stop night infiltration, a process that in turn required the blocking of the underground passageways that abounded on Topside. By these methods Japanese casualties began to mount rapidly. On the 17th, for example, over 300 Japanese were killed; nearly 775 were killed the next day. In the same two days Rock Force's casualties were approximately 30 killed and 110 wounded. Apparently in an effort to redeem their losses in a blaze of glory, Japanese at the southern and southwestern sections of Topside attempted a counterattack in the predawn hours of 19 February. Shortly after 0200 about 40 Japanese committed suicide by blowing up an ammunition dump a few hundred yards north and inland from Breakwater Point, simultaneously killing or wounding 15-20 men of the 503d Infantry who, unaware of their danger, had been occupying a building directly over the ammunition. About the same time Japanese from Cheney Ravine and Wheeler Point, 800 yards southeast of the ravine, started a ground counterattack that reached its peak around 0600. The Japanese force, nearly 400 strong, pushed some of its troops all the way to the barracks area on Topside, but the 503d Infantry finally drove them back after 0800.15 By 1100 the 503d had hunted down the last stragglers from the counterattack and had resumed its daily process of small unit actions against known strongpoints. Operations on the 19th, including the events during the night, cost Rock Force over 30 men killed and 75 wounded, the Japanese nearly 500 killed. 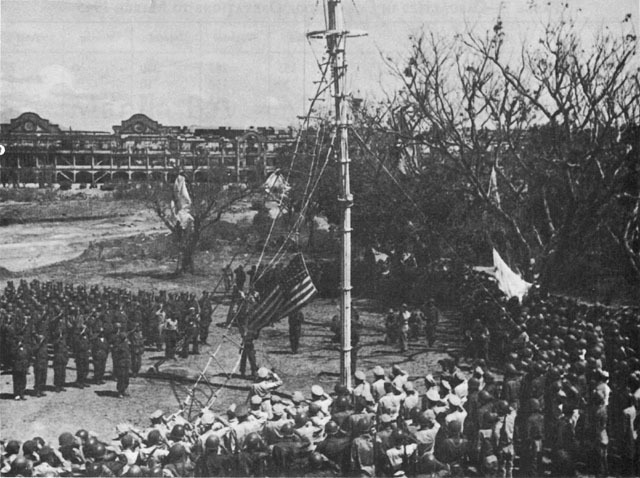 In addition, the 503d had captured 3 Japanese, the first prisoners of the battle. corner, and here resistance continued to bear some semblance of organization. The last significant opposition, centered at Wheeler Point, ended with a small-scale banzai charge on the morning of 23 February, and by 1800 that day the 503d Infantry had substantially cleared the western section of Corregidor. Colonel Jones could now direct Rock Force's full energies toward clearing the area east of Malinta Hill, which the 3d Battalion of 34th Infantry had held since the 16th. The battalion had not been inactive at Malinta Hill. The very first night ashore it had to beat off a series of small but determined Japanese counterattacks along the north side of the hill. In these skirmishes 10 Americans were killed and a like number wounded, while about 35 Japanese lost their lives. On the 17th the battalion devoted most of its time to securing the roads leading through Middleside so that the wounded of the 503d Infantry could be evacuated and supplies could be sent to Topside. Here, as on Malinta Hill and Topside, much of the fighting involved the laborious process of cleaning out small caves or, failing that, sealing them with explosives. At Malinta Hill every night was marked by numerous small counterattacks, executed by Japanese from Corregidor's tail or from within the hill's tunnels. Everyone feared that at any time the Japanese might set off tons of ammunition and explosives known to be stored in the tunnels, and during the night 21-22 February the expected happened. At 2130 a deafening explosion literally rocked the hill; flames shot out of tunnel entrances; rocks and other debris flew in every direction; fissures opened along the slopes; 6 men of Company A, 34th Infantry, were buried alive by a landslide on the south side. Apparently, the Japanese had planned a controlled explosion to set the stage for a counterattack or to allow the troops inside--now estimated to number 2,000--to escape to the tail area in the ensuing confusion. If so, the explosion had gotten completely out of hand, killing an unknown number of Japanese within the tunnels. Troops of the 34th Infantry killed other Japanese who counterattacked westward, but several hundred Japanese did manage to make their way eastward under cover of the explosion and the counterattack. Additional explosions, apparently marking the suicide of Japanese still in the tunnels, shook the hill during the night of 23-24 February. Meanwhile, Rock Force had prepared plans for the final assault against the east end of the island. The attack was to be undertaken by the 1st and 3d Battalions, 503d Infantry, while the regiment's 2d Battalion continued to mop up at Topside and the 3d Battalion, 34th Infantry, continued to hold Malinta Hill, Bottomside, and Middleside. Especially heavy air and naval bombardment preceded the attack, which began on 24 February, and the 503d's light artillery laid down the heaviest concentration of which it was capable. fires before the attack got well under way. The remaining Japanese retreated eastward, and by nightfall on the 24th units of the 503d held all but the last 3,000 yards of the tail. On the 25th the American troops decreased this distance about 1,000 yards. That night's lines ran from Cavalry Point, on the north shore, south-southeast some 700 yards to the south shore at Monkey Point. The 503d had encountered stiff resistance, including some banzai charges, near Monkey Point, and during the afternoon many of the Japanese still remaining on the tail attempted to escape by swimming to Bataan or Caballo Island. Those refusing to surrender to cruising PT's or engineer LCM's were killed by the boats' gunners and strafing planes. 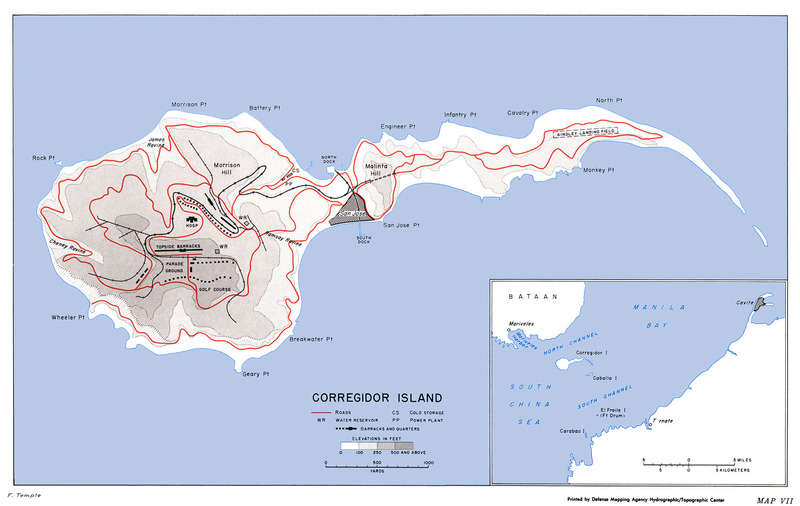 As dark came on the 25th, Rock Force was confident that the morrow would see the end of significant resistance on Corregidor. The 3d Battalion, 34th Infantry, would not be there to share in the glory, for with the 24th Division assembling on Mindoro for operations in the southern Philippines, the battalion had to leave. Its place was taken by the 2d Battalion of the 38th Division's 151st Infantry, which moved over from Mariveles. The explosion marked the end of organized resistance on Corregidor, and by 1600 on 26 February elements of the 503d Parachute Infantry had reached the eastern tip of the island. The battle was over except for mopping up small groups of Japanese holed up in waterline caves. This process the 503d Infantry had to hurry along since the regiment had been alerted to get back to Mindoro no later than 10 March in order to make ready for participation in operations to clear the southern Philippines. Source. Unit records cited in preceding footnotes. 1. This section is based principally upon: Sixth Army Rpt Luzon, I, 49-54; G-2 Sixth Army, G-2 Estimate of the Enemy Situation With Reference to Bataan-Corregidor, 4 Feb 45; USAFFE Board, Rpt 308, Corregidor Island Operation, 503d Parachute RCT, 16 February-8 March 1945 (hereinafter cited as USAFFE Bd Rpt Corregidor), 16 May 1945 (2 vols. ), I, 1-6, OCMH files; 503d RCT Rpt Corregidor, pp. 1-2; an. 1, Intel, to 503d Prcht Inf FO (Corrected Copy), 13 Feb 45, USAFFE Bd Rpt Corregidor, II. 2. Rad, MacArthur to Krueger, CA-50232, 3 Feb 45, Sixth Army Rpt Luzon, I, 113. 3. Rad, MacArthur to Krueger, CAX-50271, 5 Feb 45, Sixth Army Rpt Luzon, I, 113-14. 4. "The plan for opening Manila Bay had been in process of formulation at Headquarters Sixth Army for some time." Krueger, From Down Under to Nippon, p. 262. 5. See Morton, Fall of the Philippines, ch. XXXI. 6. Rad, Jones to MacArthur, 6 Feb 45, Sixth Army G-3 Jnl File Luzon, 4-6 Feb 45. 7. Krueger Comments, 18 Dec 56. 8. Japanese information is principally from: Japanese Studies in WW II, No. 9, Luzon Opns of the Shimbu Gp, p. 12, and No. 125, Philippine Area Naval Opns, pt. IV, p. 16; Statement of Capt Masayoshi Koma (IJN) (Staff, Southwest Area Fleet), States, II, 293; Col Kobayashi Narrative, pp. 2, 6, 10th I&H Staff Study, Japanese Opns on Luzon; XI Corps G-2 Per Rpt, 26 Feb 45, Sixth Army G-3 Jnl File Luzon, 25-27 Feb 45; an. 1, Org Chart, to 503d RCT S-2 Rpt Corregidor; USAFFE Bd Rpt Corregidor I, 2-3. 9. This subsection is based principally upon: Craven and Cate, AAF V, pp. 340-34; TG 78.3 Action Rpt Mariveles-Corregidor, passim; Sixth Army Rpt Luzon, I, 53; Sixth Army FO 48, 7 Feb 45, in ibid., I, 149-51. 10. The sources for the remainder of the Corregidor action, unless otherwise indicated, are: USAFFE Bd Rpt Corregidor, I, 3-9; Sixth Army Rpt Luzon, I, 53-55; 503d RCT Rpt Corregidor, pp. 3-6; 503d RCT S-2 Rpt Corregidor, pp. 1-7; 503d Inf S-2 Per Rpts, 16 Feb-2 Mar 45; 503d Inf S-3 Per Rpts, 16 Feb-2 Mar 45; 1st Bn 503d Prcht Inf Hist, Phase XII, 16-29 Feb 45, passim; 503d Prcht Inf S-1 Rpt Corregidor, an. 3, Casualties; 34th Inf Rpt Luzon, pp. 138-54. 11. See above, ch. XVII. 12. Anonymous, Combat Over Corregidor, 16 February 1945, Carried Out by the 503d Parachute Combat Team . . . , p. 38. This personal account, prepared by a 503d RCT medical officer, is available in photostat in OCMH files. It is hereinafter cited as Anon., Combat Over Corregidor. 13. Fire against the second lift came from a Japanese 20-mm. machine cannon and two American .50-caliber machine guns that, dropping wide of their mark during the first lift, had quickly been put into action by the Japanese. Jones Comments, 8 Feb 57. 14. Rad, XI Corps to Sixth Army, QP-3748, 16 Feb 45, Sixth Army G-3 Jnl File Luzon, 16-18 Feb 45. 15. Pvt. Lloyd G. McCarter of the 503d Parachute Infantry was awarded the Medal of Honor for heroic action in helping to repel this counterattack and for another heroic deed on the 16th. 16. The 503d Infantry borrowed an acetylene torch from a Seventh Fleet destroyer and cut open the tank to save the sole survivor. Jones Comments, 8 Feb 57. 17. Anon., Combat Over Corregidor, p. 107. 18. The 503d RCT left Corregidor on 8 March and the 2d Battalion, 151st Infantry, departed in mid-April, being relieved by the 1st Battalion. Elements of the 6th Infantry Division garrisoned the island after early May. 19. Harold Templeman, The Return to Corregidor (New York: Strand Press, 1945). Mr. Templeman, American Red Cross Field Director with the 503d RCT, jumped with the infantry on Corregidor.